« What does one million pounds look like? This entry was posted on Monday, May 10th, 2010 at 8:50 pm and is filed under Computing. You can follow any responses to this entry through the RSS 2.0 feed. You can leave a response, or trackback from your own site. Thanks for posting these results. I’m actually looking at a purchasing the same MacBook Pro and will also be looking to run Windows 7 on it. 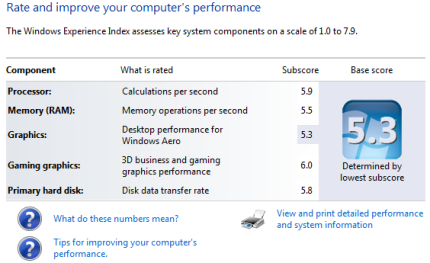 After lots of comparisons with other laptops I only had two more questions left. Your post answered one, the other is how the right click works on the MacBook Pro with the ‘look ma’ no buttons!’ design of the touchpad. I’m assuming there are two… but it’s hard to tell when having a play in the store. I’ll keep searching. Now off to read your posts on “How to be a Vegetarian in Japan”. Very relevant to my interests. The right click by default is done with a two fingered press anywhere on the touch pad (it is multi-touch). You can also configure the touch pad to accept either a single press on the bottom left, or bottom right hand corner to activate the right click. This works on both Mac OS X and Windows 7. I’ll be posting a review of what I think of Windows 7 running on a MacBook in the next few weeks – (it works – but there are some problems). I am in the market for MacBook Pro and is interested in knowing about running Windows 7 using Boot Camp. Could you please post your review about running Windows 7 on 2010 MacBook Pro? Thanks for the experience index article. It is very helpful. I believe the windows experience index score may also be correlated to the amount of hard drive you have partitioned to run Windows on your Mac. I have my 2011 2.5 GHz Core i5 iMac, running 8GB of ram, partitioned at 30GB for Windows and it only comes up with a score of 4.5. I thought the score was a little low, so I clicked the “view and print detailed performance and system information” link, and the pop-up screen showing the detailed information says that I only have 1GB of ram, 1 processing core, etc. But it’s possible that the reason for the discrepancy is because I’m running Windows through VMware Fusion instead of Boot Camp. Typing this out just made me realize this, haha. I’ll test out the score on Boot Camp and let you know if it changes. Thanks.